Location: Kuranganilmuttam near Kanchipuram . Description: This is a Shivastalam located to the south of Kanchipuram near the town of Mamandur and the hamlet of Dusi. This is the 6th of the 32 Tevara Stalams in the Tondai region of South India. Legends: Vaali worshipped Shiva at the entrance to the temple while a squirrel worshipped from the South and a crow from the North, hence the name Kuranganilmuttam. Hanuman is also believed to have worshipped Shiva here. Images relating to these legends are seen in the temple. The temple: The sanctum in this small temple faces west, although the entrance to it is from the South. The temple is built on a rock, and there are inscriptions here from the days of Krishna Deva Rayar. There are unfinished rock cut temple in the vicinity of Kuranganil muttam dating back to the Pallava period, some with inscriptions. Sambandar is said to have visited this shrine after visiting Cheyyar and Tirumagaral. 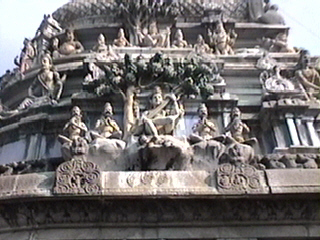 The image above is that of the Gajaprashta Vimanam at Tirumagaral.